Posted by Cora Hall on February 8, 2019 in Basketball, Sports, Top Stories. 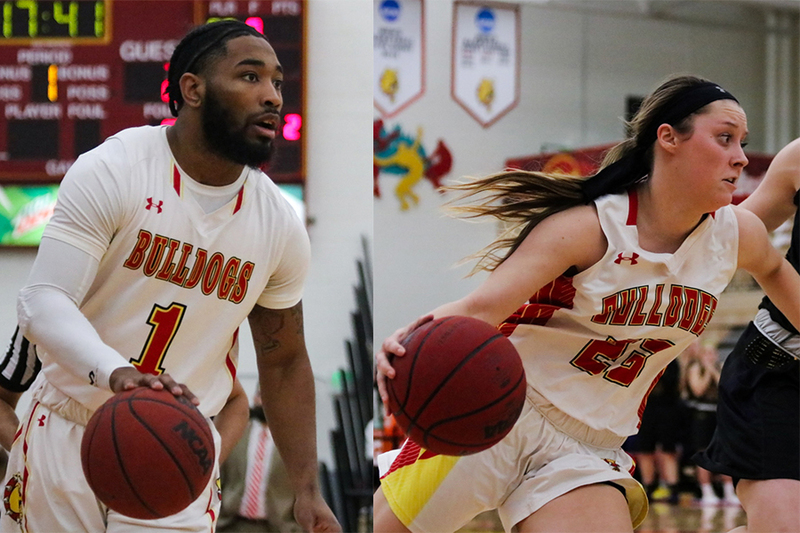 In the nationally televised matchup against Ashland University, the Bulldogs fell behind and couldn’t make up lost ground for the first time at home this season. Ferris women’s basketball faced a challenge entering Thursday, Feb. 7’s game against the No. 11 Eagles, who sat at a 19-1 overall record and 11-1 in conference, falling only to Grand Valley State University so far this season. The Eagles have been strong offensively all year, averaging 91.4 points per game, and have been shooting just more than 50 percent from the field as a team. The last time Ferris faced Ashland in December, they lost 94-60. In search of a win after the 73-60 loss to Northwood University Saturday, Feb. 2, the women also kept a home record to keep perfect, having gone 8-0 at home so far. But after slipping by eight points at halftime, the Bulldogs could not recover, and Ashland would take home a 91-79 win. Ferris senior guard Alexis Bush, who scored 22 points and had seven rebounds in the game, said the Bulldogs are a different team than that which faced Ashland earlier in the season, and the game could have gone either way. “I think on some plays, just defensive consistency — that’s a little of what we’ve struggled with this season — is just playing 40 minutes of full team defense,” Bush said. “We came out strong against them. The last time we played them we went on, I think, a 7-0 run and then we let them back in the game. The game began as an offensive battle, each team trading baskets through the first quarter. It wasn’t until halfway through the second quarter that the Eagles began to create a lead. The score at halftime was 43-35 with Ashland in the lead. Ferris stayed in the game through the third but were unable to chip away at Ashland’s lead through turnovers. Ashland’s Jodi Johnson dominated offense with 24 points by the third quarter’s end. Ferris head coach Kendra Faustin said the game plan was to slow it down to make the Eagles play as much defense as they could. The Bulldogs would fail to create the offensive momentum they needed to come back in the fourth, with the Eagles keeping the lead around ten points the entire quarter. Ashland took the win and Johnson scored 30 for the Eagles. Ashland led in total rebounds, 51-33 and Faustin said that was a big factor in the loss. “We struggled rebounding, I mean, that was the difference of the game. We took care of the ball relatively well, we had a remarkable … 24-15 assist to turnover ratio, we moved the ball really well and I’m really proud of those things,” Faustin said. “I thought we took good shots, I thought for the most part we took good care of the ball, when we needed to press we got two turnovers. “You know, I think the difference between the game is we made a couple defensive mistakes and couldn’t grab some rebounds and they got way more shots than we did,” Faustin said. Ferris junior guard Riley Blair finished with 16 points and two rebounds. Blair said she was proud of how their team broke down Ashland’s defense, but they need to clean up their play in the last stretch of the season now that they’re close to full strength from injuries. Faustin, who was emotional at the thought of losing Bush at the end of this season, said both Blair and Bush are irreplaceable veterans on the team. Ferris will face Wayne State for more conference play 1 p.m. Saturday, Feb. 9, in Jim Wink Arena. Fighting a deficit for the majority of a game is a difficult task, and for the men’s basketball team, they would never make it back ahead of the Ashland University Eagles Thursday, Feb. 7. Ashland, ranked No. 15, entered the nationally-televised matchup 18-3 overall and 10-3 in the Great Lakes Intercollegiate Athletics Conference (GLIAC), sitting atop the South Division while Ferris was No. 1 in the North Division. In their previous game against Ashland in December, the Bulldogs lost a close game with a score of 91-88. The loss this time would be by 11, and the score at the end of the game was 67-56 in favor of the Eagles. In the NCAA Division II Game of the Week, the Bulldogs matched the energy of the Ashland starters from the tip off. After four minutes of play, Ferris senior wing Markese Mayfield had eight points, accounting for all of Ferris’ points at the time. Ashland was quick to answer, though, and tied the game up at 8 in what would be one of two ties and five lead changes in the first ten minutes. The Eagles created a lead they held the rest of the first half, leading by as much as 11 in the first. The half would end with Ashland in the lead, 41-33. Ferris head coach Andy Bronkema said the team needed more shots to fall for them and that if they want to beat Ashland if they face them again, they have to improve. “I think if we would have hit a few more shots, we would have been in the game and made it interesting,” Bronkema said. “You know, it’s hard to play with energy and enthusiasm when your shot’s not falling, and that was kind of the story of the night against a really good team. Ashland maintained a steady lead during the first ten minutes of the second half, but the Bulldogs slowly chipped away at what was an eight point lead to make the score 47-50 with ten minutes left, thanks to a bucket by Ferris freshman center Mason Pine and a three from Ferris sophomore wing Armani Tinsley. The Bulldogs fell in score but would come within three points again before the game was over off a three-pointer from Ferris junior wing Greg Williams. However, Ashland took home their second win of the night in what was an uncharacteristically low scoring game on both ends. Ferris, with an average of 88.3 points per game on the season, shot just 32.8 percent from the field and Ashland, who averages a score of 76.4 points per game, shot 49 percent from the floor. The Bulldogs out-rebounded Ashland 36-34 and Mayfield led the team with 12 points, nine rebounds and two steals. Players off the Ferris bench scored 19 points on the night, and McFadden said having a deep bench is huge for the team. Bronkema can be seen throughout the game as the catalyst for his energetic reserve players and to him, it’s part of the culture he tries to create. The Bulldogs face more GLIAC action against the Wayne State Warriors 3 p.m. Saturday, Feb. 9, in Jim Wink Arena.